A recap of Game One of the Boston/Toronto. Luke Maile, (Top), hit the wiinning home run in the 12th inning. Luke Maile had a heck of a game last night. Maile went three for four at the plate last night and collected four RBIs. 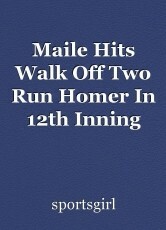 Maile also hit the winning home run in the 12th inning to give his Toronto Blue Jays a 5-3 win over the Boston Red Sox. At the top of the first inning, Mookie Betts scored on a routine ground out by J.D. Martinez. In the bottom of the inning, Josh Donaldson tied the game 1-1, driving in Teoscar Hernandez with a RBI single. In the bottom of the second inning, Maile put the Jays ahead 2-1 by driving in Kendrys Morales with a single. Xander Bogaerts tied the game in the fourth inning with a solo home run. The Red Sox went ahead 3-2 later in the inning when Brock Holts scored on an error. In the bottom of the seventh inning, the Jays tied the game 3-3 when Maile hit a solo home run. Boston's starting pitcher, Chris Sale, had a fantastic night on the mound. Sale pitched nine innings, gave up six hits, three earned runs, no walks, and struck out an amazingly 15 batters. Toronto's starter, Aaron Sanchez, gave up five hits, two earned runs, and struck out just two batters in five innings pitched. This page was created in 0.4250 seconds.